Set off for my long run of the week in overcast but pleasant weather. It did rain half way round but it was quite refreshing. I realised that would be my last long run on the Braes before the whw race. Next week will be our two day run, then I’ve got the Kirkcudbright half marathon, then I’m joining others for a night run. That will take me up to three weeks to the whw race and I’ll be tapering! I ran well for the first 2 hours today but I struggled a bit for a while. I think the effects of a hard 10k on Wednesday caught up with me. I got going again and finished strong but I’ve been feeling very thirsty since. I ate a pot of baked beans, a rice pudding, 2 tangerines and a handful of jelly babies on the run. Plus about 500ml of water. I put my 10k time into one of those race predictor sites and this is what I came up with …. So according to this I ought to be able to run the Kirkcudbright half marathon in 1hr 26min 30secs which is the most conservative of the predictions. I must admit I find the Purdy formula to be more accurate. 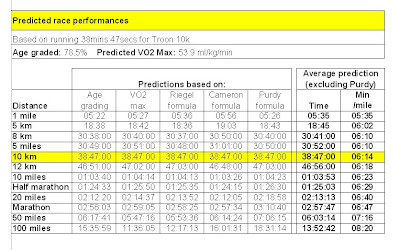 Purdy predicts a 3.10.40 marathon whereas the average of the others suggest 2.57.47 which I think is very optimistic. I also put in Katrina’s details and Purdy comes up with a prediction for 2hr 17mins 46secs for a half marathon and 5hr 10min 10sec marathon. Do you think I should show it to Katrina????? I mentioned that I wanted to try and run a negative split on Wednesday. Well I’ve just checked my splits and I did!! First 5k 19.34, second 5k 19.10. I can’t remember running many, if any races, with a negative split so I’m pleased with that. Can I do it for my half marathon? (Debs – you can stop reading now!!!) Sunday is the final day of the Premiership. So final prediction for this season – Everton to win 2-1 against Newcastle to gain that 5th spot and I reckon United to beat Wigan to pip Chelsea. This entry was posted in Glennifer Braes, Race Predictor. Bookmark the permalink.